When August Wilson gathers a group of guys, you know that storytelling is going to get a good workout. Maybe Red Carter will be jawing about the time he tried to juggle seven women and found it so hard he had to quit his job. Maybe Canewell will be giving an unsolicited lesson on the best way to cook greens. And chances are good that an old blues song – could be a pre-Elvis version of “That’s All Right, Mama” – will be playing on a radio close by. Those groups of guys are one of the most amiable attractions of Wilson’s plays, a collection of 10 dramas that chronicle African-American history throughout every decade of the 20th century. In Seven Guitars, People’s Theatre’s newest production, Wilson’s sense of the way his people talk and the way they pass the time brings this play to life. 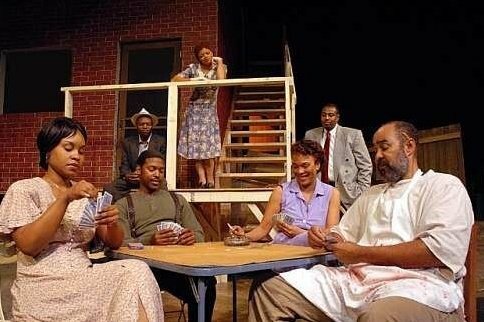 People’s Theatre has taken on Wilson three times before, from Fences in 2002 and Ma Rainey’s Black Bottom in 2003 to Two Trains Running in 2006. But Seven Guitars, with its terrific seven-person cast, shows this little theater company at its best. Set in Pittsburgh in 1948, Seven Guitars is the story of Floyd “Schoolboy” Barton, one of Wilson’s prototypical dreamers, a young man who has recorded a hit song (“That’s All Right, Mama”) and, just out of jail, wants to go back to Chicago to make another one. The problem is money: The record company paid him only a flat fee, long gone; his guitar is in the pawnshop, and his white manager is hard to track down. And the problem is a woman – Vera, a steady presence who won’t commit to Floyd until he gets his feet back on the ground. 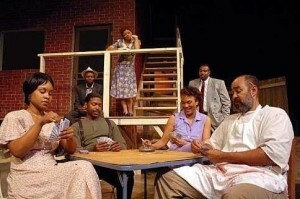 Under Rus Blackwell’s direction, People’s makes the most of Floyd and his friends, from Barry G. White’s light-on-his-feet Canewell to Randall Jackson’s dapper Red and Trenell Mooring’s hard-edged, big-hearted Ruby. Marci Stringer gives a graceful performance as the conflicted Vera, and Contona Thomas makes a charismatic Floyd (although on opening night he had to cast about a bit for his lines). The play falters during its many long scene changes, and the costumes look too modern and generic to recall the ‘40s. But most of Seven Guitars makes it easy to forget those shortcomings. When you can listen to Wilson’s stories and watch these actors do their stuff, “That’s All Right, Mama” is about as apt as it gets.